Stony Brook Baseball traveled upstate to play a three-game series against its in-state rivals Binghamton on April 13 and 14. 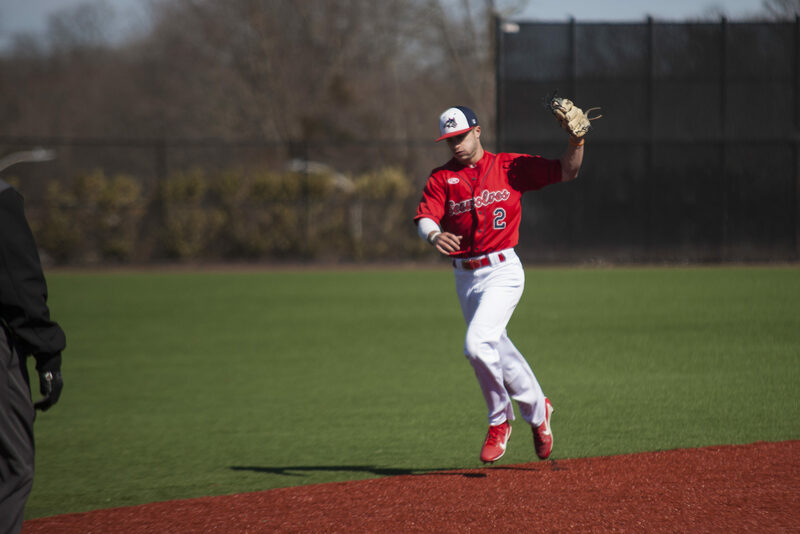 While the two teams split Saturday’s doubleheader, Stony Brook’s offense guided them through Sunday’s rubber match as their record improved to 20–11 overall and 9–3 in the America East. Stony Brook found itself in a hole early during the first game of Saturday’s doubleheader. Redshirt-junior pitcher Greg Marino was given the start but allowed two third-inning runs, as well as a solo home run to senior outfielder Anthony Meduri in the bottom of the fourth to put Binghamton up 3–0. The Seawolves offense began to stir in the top of the fifth, as senior infielder Brandon Janofsky walked, junior infielder Nick Grande singled to center and junior first baseman Chris Hamilton walked, sending senior infielder Brandon Alamo to the plate with the bases loaded and two outs. On the second pitch of the at-bat, Alamo deposited the ball over the right field wall, putting Stony Brook ahead 4–3 on the grand slam. Marino would cough up the lead in the bottom of the seventh, allowing a two-run homer to sophomore outfielder Shane Marshall. He was promptly removed as freshman pitcher Nick DeGennaro entered in relief, allowing an RBI double as Binghamton took a 6–4 lead. Down to their final three outs, Stony Brook’s bats began a rally once more. Janofsky led off the inning with a four-pitch walk and after Grande flied out, Hamilton hit a double to left, advancing Janofsky to third. Junior outfielder Michael Wilson, in the midst of a 4-for-22 slump, cut the deficit to 6–5 on an RBI single. Alamo would tie the game on a sacrifice fly to center field. As the game moved to extras, Grande drove in the winning run of the game in the top of the tenth, scoring freshman infielder Johnny Decker on a single to right field. Junior reliever Sam Turcotte struck out three Bearcats to ensure the 7–6 victory for the Seawolves. The second game of Saturday’s doubleheader would not go nearly as well for Stony Brook. Despite out-hitting the Bearcats 8 to 6, the Seawolves’ offense could not put runs across the plate as they were shut out 5–0 by junior pitcher Ben Anderson, who pitched a seven-inning complete game and struck out nine in the process. It was the first time Stony Brook had failed to score since their Feb. 24 matchup at Southeastern Louisiana. The Seawolves’ starter, junior pitcher Brian Herrmann, was removed from the game after 2.1 innings despite not allowing a single baserunner. Meduri gave Binghamton a 2–0 lead in the bottom of the fourth on a 2 RBI single, and insurance runs were added in the fifth inning, courtesy of a groundout from sophomore outfielder Andrew Eng and a two-run homer by redshirt-junior infielder Alex Baratta. Grande’s bat was the star of the doubleheader. He went 5-for-9 on Saturday, adding in a walk and a stolen base to provide a spark at the top of the Seawolves’ lineup. His batting average stood at .403 following Saturday’s contests. Sunday’s rubber match became a high-octane offensive battle in the second inning. The top of the frame saw the Seawolves tack on four runs, bolstered by a single from senior outfielder Dylan Resk, a Janofsky double and a Grande double. In the bottom of the second, Binghamton chipped away at the lead. With men on first and second and two outs, junior infielder Justin Drpich hit a three-run homer to left field, bringing the score to 4–3. The Seawolves would add two more runs in the top of the seventh to bring the game to its 6–3 final score. Sunday’s starter for Stony Brook, senior pitcher Bret Clarke, had been the team’s most effective starting option throughout the entire season. After the second inning home run, Clarke would settle down, allowing just two more hits during the rest of the game. He pitched seven innings, allowing just the three runs on four hits, striking out five. In 36.1 innings pitched on the season, Clarke owns a 2.48 Earned Run Average (ERA). The Seawolves will return home to take on another in-state rival, the Albany Great Danes, hosting a three-game series on Friday, April 19 and Saturday, April 20. Friday’s doubleheader and Saturday’s game are both set to begin at 12 p.m. at Joe Nathan Field.